Am I becoming accustomed to this now? No, I am not talking about blogging, I am talking about, "Thinking something amazing to write about and then forget about it when the time comes!?" I don't know, but it's not good :/ Again I forgot like the Tuesday what I thought for Thursday to post here. But hey!! I recalled! Damn, this was a bad jump back on the topic! :O Anyways, let's get serious, and start talking. The famous words of Franklin D. Roosevelt - "The only thing we have to fear is fear itself" is what's on my mind to discuss with you all today. The famous quote reminds me of an amazing story I read in my last school year, "Deep Water". It was the story about William Douglas' fear of water and how he overcame it. It was an amazing excerpt and it was quite inspiring. To be honest I am not sure if these were first said by Roosevelt only because the Internet sources have these words in his speech. The quote I mentioned above is a great quote and I just think it's one of my favourites. It not only fills my heart with courage but gives me strength at times when it is needed the most. This even makes me recall the famous advertisement of a beverage that said "Everyone is afraid of something, but the one who moves ahead of it, is the one who wins". In the context of the quote, this line is quite matching. Actually if you say you don't fear anything, you are just reassuring yourself that you are brave, thought maybe you are not. But if you are honest and know things that scare you, you can think of ways to deal with your fear and be a winner. The point I want to highlight is that, being scared is not bad. Now you must wonder how does that goes with the quote I was sharing? Actually, the quotes have a hidden meaning. You should fear nothing, means you should be brave to face anything that scares you. Fear the fear itself, means only thing you should not let your mind be is afraid of a situation and step back. You might be scared for once, but if you be courageous and take a step further, you never know what you may achieve. 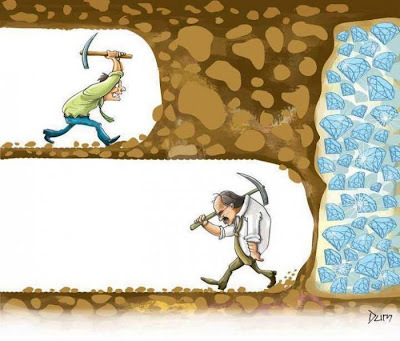 This reminds me of a pic I saw on facebook(I'll upload here if I find it on the Internet again) that said you never know how close to your goal you are, so never give up. So coming back to what we were discussing. Actually fear is a feeling that is there in everyone's heart. The only thing is who fears what. Someone might be scared of dark, and the people'd be laughing at him and at the same time, the one's laughing might be scared of thunderstorms! So don't be disheartened that you are scared of something. Being brave doesn't mean that you are not scared of anything, but it rather means that nothing can scare you. What's the difference? Well, being scared means you are scared of something, but if something can scare you it means it will throw you away from your path, but being scared of something and taking a step further shows that yes! you are the most courageous person in the world. now some readers find this misleading and think they are scared of their parents and now they won't be and they will be rude to them. Excuse me! There is a difference in being brave and decent. Ah, I always go off topic. Fear the fear itself means that there should be nothing that makes you take a step back on your path. Of course your path should be the right one and justified. You should not take unjust steps. One important thing is if you are not wrong, fear itself will be less cross ways with you. If you are doing something wrong that might raise a brow, in that case the caution level is high and you'll be scared of any sound, even a pin drop. The point is simple, if you are right you should not be scared of anything. Moreover, the fear of fear doesn't mean that you have to be scared of fear, NO! It simply means that you don't have to let fear push you back on your way ahead to success.